and up comes the sun. and the day is born. With only three lyrical sentences, this elegant, simple yet complex poem about the diurnal round brings to life all of the aspects of day and night. Here, all have volition and all cooperate for the greater good of the whole: Rooster pulls in his blanket of clouds to bring in the sun, who opens its hand to bring forth the day, who is surprised at the advent of night, who brings forth the stars for Rooster to eat and clear the sky for a new day. 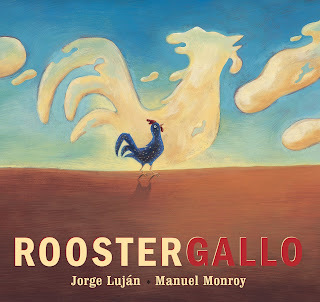 Monroy’s striking images of bright and muted watercolors on a palette of blues, browns, golds and greens darken as night approaches and lighten at daybreak; he masterfully depicts Rooster sometimes as a weathervane, sometimes in the shape of a cloud, sometimes bringing in the day, and sometimes spreading his cloak to release the stars. The design, which forefronts Luján’s original Spanish in large red letters, is followed by the English translation below in smaller black or blue type that contrasts with the background. 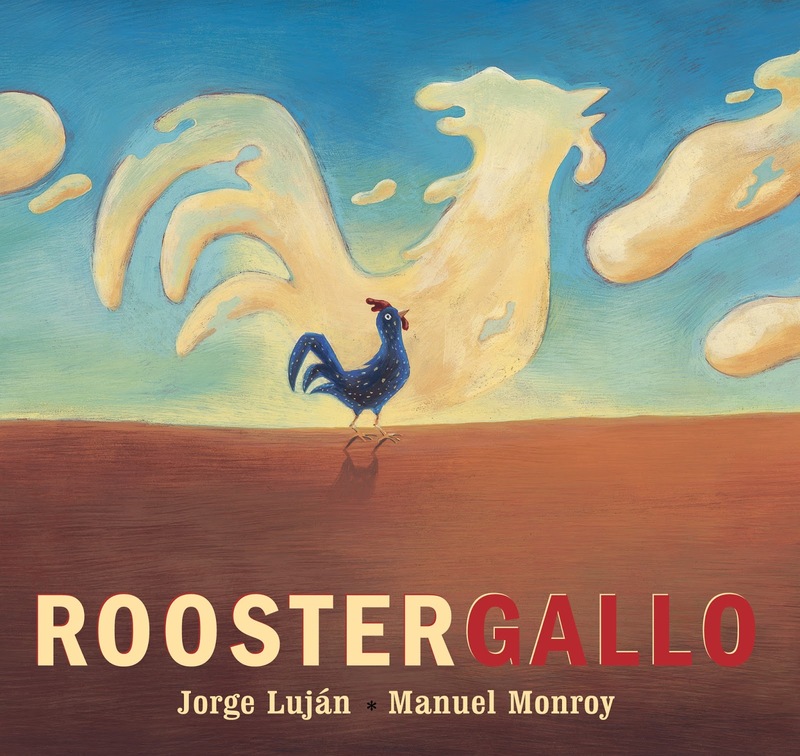 Written in Spanish and beautifully translated into English, Rooster / Gallo is a brilliant little book with a large meaning. For babies, children and adults to enjoy at their own levels of understanding, it’s highly recommended. There was an advertisement linked to the previous post, so I removed the post. Really i found your blog after long time ago really very amazing blog well done.